From Spring through to winter, bulbs offer all gardeners a wonderful chance to brighten up their garden with a beautiful display of colourful, fragrant and delicate flowers. If planted correctly bulbs will produce stunning blooms with very little effort. Bulb Starter is the perfect way to get the absolute best from your bulbs. All our starter products contain rootgrow mycorrhizal fungi as the primary function. These special fungi form a relationship with the root of plants creating a vast secondary root system which acts to provide plants with water and nutrients. All starter products should be put into direct contact with the roots of plants so that the fungi can form this valuable relationship as quickly as possible. 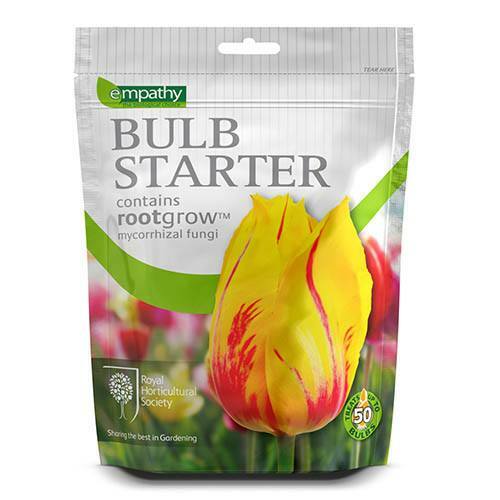 One pack of BULB STARTER can treat up to 50 medium sized bulbs. Step 2 Place Bulb Starter into the base of the planting hole. Step 3 Plant directly onto product, backfill and water.